WEP (Wired Equivalent Privacy) keys are used to protect wireless connection setup. You can generate WEP keys of different lengths like 64, 128, 152, 256 bits. A strong WEP key is a healthy mix of random numbers and letters. It is always recommended to use long and complex WEP key to secure wireless connection. 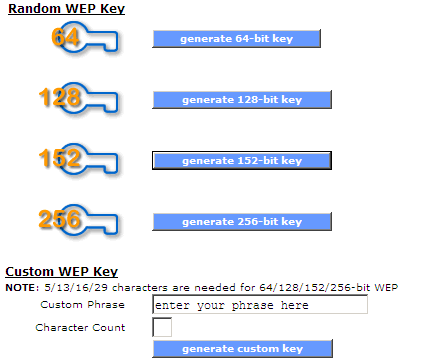 You can use either of following online WEP key generator tools for a strong WEP key. 1. WEP Key Generator – Andrews Companies website has easy to use online WEP key generator. You can generate random key at a click of a button for different bit length including: 64, 128, 152 and 256 bits. It also has option to generate custom WEP key. 2. WEP encryption Key Gen –YellowPipe has single click online tool to generate WEP encryption Key to secure your Wireless connection. Just select key bit length among 64, 128, 256 bits and click ‘Generate WEP key’ button. You can use WEP key generated using either of online key generator. If you happen to forget the WEP key, then you can easily recover it using WirelessKeyView tool or check router settings for WEP, WPA details.